De Activ van RED is een uiterst stabiel board, dat daarom ook zeer geschikt is voor Yoga- en/of Pilates-sup. Het heeft een doorlopend zacht deck en de draaghandels zitten aan de zijkant, zodat je ongestoord de Yoga-oefeningen kunt uitvoeren. 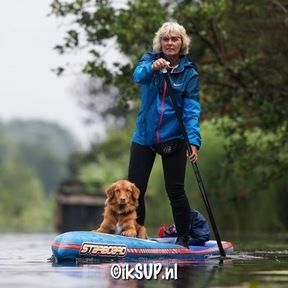 Dit board is ook zeer geschikt voor de Honden-sup met de wat grotere honden! People have always flocked to the water for its tranquillity. Early on, we discovered people were taking their Red Paddle Co inflatable SUPs to the water for yoga, pilates and stretching, so we created a board specifically for them. It is called the 10’8” Activ, and is based on our 10’8” Ride, but with increased thickness to reduce wash over the board so you can stay dry during your workout. The additional thickness provides greater rigidity and the 34″ width provides a stable platform, making the board perfect for yoga poses. The carry handles have been moved to the side of the board so they don’t get in the way. The final touch is the Red embossed EVA deck, which acts as a full yoga pad with a centre line down the middle of the board to help you position yourself and stay balanced. It’s great for paddling too, so you can go to a perfect spot and relax properly, and with our industry leading Titan pump supplied as standard you can inflate you board without breaking a sweat ahead of your session on the water.